Palestinians Return to the Temple Mount? "Police Commander of the Jerusalem District Maj.-Gen. Yoram Halevi said on Thursday morning that he expects many Muslim worshipers to attend prayers at the al-Aksa mosque on Friday, and that he expects attempts to harm police personnel and civilians." With continuing incitement at all levels of the PA, why should we expect anything else? Palestinian Hypocrisy? No, it’s worse, far worse! Falseness, deceit, dishonesty, mendacity, pretense, duplicity – take your pick – can describe some of the Muslim world’s predictable knee-jerk reaction to Israel installing metal detectors placed outside at the entrance to al-Ḥaram al-Qudsī al-Šarīf, (“the Noble Sanctuary of Jerusalem”), or as referred to by Jews as the Temple Mount – but it is far worse. It is incitement to murder and all those hypocritical counties supporting the PA’s nefarious position – it is nothing less than complicity of the same charge. With a pretense of “holy sensitivities” – as if God; any God – would not support an action that saves lives, the PA, and their fellow merchants of death, have come up with the argument that metal detectors are “an instrument of the occupation”. What a spurious ‘argument’; how disturbing that it finds traction with those same countries – including the PA – that have those same metal detectors to save lives at their holy shrines and sites. Metal detectors are not political, they are devices to save lives – the lives of Muslims, Jews, Christians, Druze, Bedouin and atheists, heterosexuals, gays and our animals, who are not party to politics or religion but are all equally – creatures of God. Whether to Laugh or Cry? Whether to laugh at the obvious stupidity of hypocritical leadership or cry at the potential tragic results, one must ask – Why the sudden outcry? Thousands of Palestinians pass daily through metal detectors at shopping malls and state institutions, such as the Post Office, Railway Stations, the National Insurance Institute, hospitals, and medical centers. They don’t complain because they know it’s for their personal safety. If they staged such protests at any airport in the world, they would not be allowed to fly anywhere – including to Mecca on Hajj! Yes, in Mecca, the Saudi Arabia government has made compulsory the wearing of electronic bracelets by the millions of pilgrims as a security measure. The only reason for the outrage is another means to galvanise support to undermine Israel. If lives are lost, they don’t care; they invite it for they are the Merchants of Death. And the audacity to assume that God supports this murderous venture and to expect countries who all have introduced these same security measures, is beyond belief. Who among the international community are likely to sign off on this? • Surely not Bangladesh, where Security Magnetometers were placed at the entrance to the National Central Mosque in its capital Dhaka, at the end of 2016 after a terrorist attack killed 20 people. to a Mosque in New Delhi, India. • Surely not Kuwait which installed Security Magnetometers at the entrance to its mosques in 2015 and 2016 after numerous terror attacks that took place in mosques in the kingdom at that time. • Surely not Indonesia, which has the largest Muslim population than any other country in the world and has installed metal detectors at the entrance to a Catholic church in Jakarta to protect the lives of Christian worshipers. • Surely not France, which has the largest Muslim population in Europe and where there was no outcry when in November 2015 manual security checks for worshipers were conducted to those entering a mosque in Paris after the combined attack in the French capital in which 130 civilians were murdered. • Surely not the USA who is trying to restrict easy entry of citizens from certain Muslim countries even entering the country. In truth, surely not any country in the world with a responsible government. Israel installed the Security Magnetometers at the entrance to al-Ḥaram al-Qudsī al-Šarīf or Temple Mount ONLY after two Druze Israeli policemen standing guard were shot by weapons that had been smuggled inside earlier because there were no metal detectors. The tragic result was that the policemen who were looking outward were attacked by surprise from the inside. Where is the Palestinian outcry about this MURDER or the incitement that has followed with three elderly Jewish civilians being murdered in a bloody knife attack. Is this what the PA is asking the world to endorse – the right to murder? 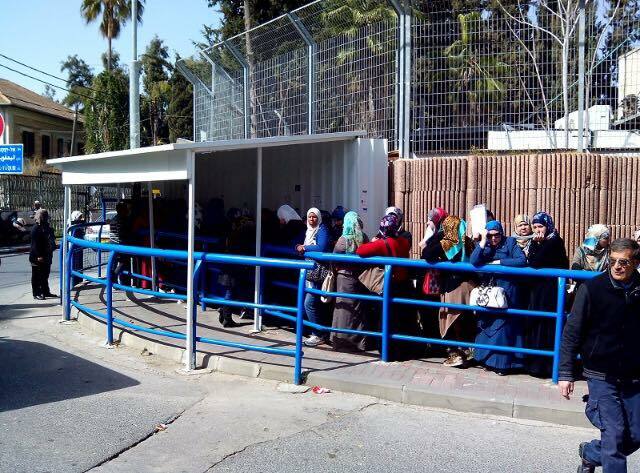 The PA, Jordan and Turkey are accusing Israel of violating the status quo by installing metal detectors. This could not be further from the truth. The Israeli government did not take the decision to install the metal detectors to alter the status quo or stop Muslims from praying; on the contrary, they took it precisely to preserve the status quo in a secure and safe environment. Why did they protest the plan? No brainer – the Palestinians were afraid that their violence, harassment and amassing of weapons to attack Jewish visitors and police officers would be captured on camera. It is this same thinking as to why they oppose the metal detectors – they want to be free to murder Jews. In the same manner as measures to secure holy sites in Egypt, Saudi Arabia, Kuwait, Indonesia, the Emirates, France and nearly everywhere in the world, it should apply no less than in Jerusalem that has built into its name – shalom and salaam – PEACE. The world needs to bring some sanity to the PA leaders that they are not free to incite murder! Why is there a humanitarian crisis in Gaza? When it Comes to Money - No Problems!! government, there is no such problem. This week, Jason Greenblatt, the US president’s Middle East envoy, did announce some welcome news at a press conference: The Israelis, Jordanians and Palestinians will be cooperating on a large water infrastructure project, which will provide billions of gallons of new water supplies for each of the three parties. That project — first announced in December 2013 — will take water from the Red Sea, near Israel’s southernmost city of Eilat, and use gravity to carry the water 137 miles via the kingdom of Jordan to the southern part of the Dead Sea. There it will be desalinated, with the brine deposited in the shrinking Dead Sea and the fresh water transferred into Israel for still-to-be-built desert farms. In exchange, a water pipeline will be built from Israel into Jordan’s capital, Amman. The strategic genius of the plan is that it weaves vital economic interests of these sometimes-antagonists together. The biggest news out of the press conference is that senior water officials from Israel and the Palestinian Authority shared a stage and warmly engaged with each other. It is, so to speak, a high-water mark in Israeli-Palestinian history regarding this precious resource. Beginning in 2008, the Palestinian leadership decided to turn water into a political tool to bludgeon Israel. The claim, which gained currency among some in the human-rights community and the news media, was that Israel was starving Palestinians of water to oppress them and to break their economy. To keep this manufactured water crisis from being exposed as a sham, it was necessary to have Palestinian water projects grind to a halt. The self-sabotage of the anti-normalization campaign was felt nowhere more strongly than in water. Israel’s settlements suffered from a lack of new water projects, but the Palestinians suffered more. Quietly, the Palestinian business community made clear that the value of blackening Israel’s name in some quarters was not worth the price being paid in quality of life and lost business opportunities. SodaStream, an Israeli company, hit the world headlines when the boycott (BDS) campaigners attacked the company's products claimed they were produced in "Palestinian occupied lands". The company at the time was employing over 1000 workers of whom 65% were Palestinian. Some of the original Palestinian workforce have received work permits to allow them to work in the new facility and although the present numbers , 80 is likely to double shortly, it is a far cry from the numbers previously employed. I have always believed that the purpose of this blog is to inform of events or activities here in the State of Israel. I have not wanted to get involved in the politics of other countries. However, the video below is so blatant in its effect on student attitudes towards Israel that I think it important to bring it to the attention of as many people as possible, including Senators, Congressmen and the media. How come the American taxpayer is funding this level of anti-Semitism? The BDS movement has been demonizing Israel online since the movement was created and although it has taken time, there is an going backlash by pro Israel activists that are turning the tide. By highlighting the hypocritical actions of the organisers, more and more people are beginning to realise the true message of these bullies. Recently virulent anti-Israel critic Ken Loach recently chided rockers Radiohead for performing in Israel, while he regularly screens his own films there. Loach vocally condemns artists who perform in Israel as supporting an “apartheid regime” and calls on others to boycott Israel. However, his latest film “I, Daniel Blake” is currently showing in Israeli cinemas. Further, more and more States in the USA are passing legislation banning the state from doing business with those businesses supporting the boycott message. We read almost daily of legal battles being won, most recently the students association at the University of Ontario won a ruling against the banning of a pro Israel group of attending campus events. In the eyes of the Vice President of the Israel Project the Boycott, Divestment and Sanctions operatives are already losers. So Much for Being Isolated!! As well as losing the military battles, our enemies seem to have lost their war to isolate Israel. - 1.74 million tourist entries in Jan-June 2017, 26% more than same period last year increasing revenue from tourism to NIS 9.4 billion in Jan-June 2017. High-ranking Palestinian and Israeli officials gathered in a field outside the West Bank city of Jenin on Monday to turn on the first-ever piece of Palestinian-owned electricity infrastructure and ink a new electricity agreement between the two sides. The deal, hailed as “historic” by signatories, will for the first time set parameters for the supply of power between Israel and the Palestinian Authority, which for years has seen the PA default on billions of shekels of debt and Israel subsequently withhold electricity. After the signing of the agreement, Palestinian Authority Prime Minister Rami Hamdallah, Israel’s Minister of National Infrastructure, Energy and Water Resources Yuval Steinitz, Israel Electric Corporation Chairman Yiftah Ron-Tal and Coordinator of Government Activities in the Territories Major General Yoav Mordechai together turned on the Al-Jalameh Substation. Al-Jalameh is the Jenin-region village nearest to the station, in the northern West Bank. The station will allow Israel to send up to 135 more megawatts to the northern West Bank area, though the agreement currently calls for just 60 more. The energy will provide a much-needed boost to the Jenin area, which has suffered power outages more than any other Palestinian West Bank region. The station also represents the first time the Palestinians will be able to control the distribution of the electricity to their own towns and cities. The PA will still have to buy its power from the Israel Electric Corporation. But apart from that, once the power is handed off to the PA, it’s in Palestinian hands. When infrastructure breaks down — which once necessitated Israeli teams escorted by the army to perform repairs, which inevitably caused delays — Palestinian teams will be responsible for dealing with any problems. The station was built by the Israel Electric Corporation, by both Israeli and Palestinian workers, but it is owned by the Palestinian Electric Authority (PEA) and the PA. The IEC also trained Palestinians to work, maintain and fix the site. Jenin is the first region to receive a substation, but three more are on the way — in the Hebron region in the south, in the Ramallah region in the center and in Nablus in the mid-northern West Bank. With all four stations, the Palestinian Authority will control the power flow across all the territory it controls. He thanked Israel for “its cooperation to facilitate” the completion of the project. These substations are only the first phase in a plan to make the Palestinians more energy independent. The document signed on Monday only pertains to the Jenin area. It is a smaller agreement that is meant to pave the way for a contract that will deal with the entirety of electricity cooperation between Israel and the PA. The Al-Jalameh station, built in three years, was bought from the IEC for 12 million euros. The project was partially subsidized by Italy, Norway, the European Union, USAID, and the European Investment Bank. In September 2016, the PA and Israel signed an agreement that transferred control of West Bank electrical infrastructure to the PA. Under that deal, the PA also began paying off its outstanding power bill of NIS 2 billion ($560 million). Three quarters of that is still owed, and is meant to be paid off in 48 installments. The contract signed on Monday allows the IEC to increase electricity supply to the Jenin region without fearing the piling up of more debt from the Palestinians. Prime Minister Benjamin Netanyahu and Indian Prime Minister Narendra Modi, this afternoon (Wednesday, 5 July 2017), met with Moshe Holtzberg, whose parents were murdered in the 26 November 2008 terrorist attack on the Mumbai Chabad House. He told them that he misses India; Indian Prime Minister Modi said that his country was open to him. Prime Minister Netanyahu invited Holtzberg to accompany him on his future trip to India. Moshe Holtzberg was accompanied by his paternal grandparents (Nahman and Freida Holtzberg), his maternal grandparents (Shimon and Yehudit Rosenberg) and by Sandra Samuel, his former Indian nanny who came with him to Israel. 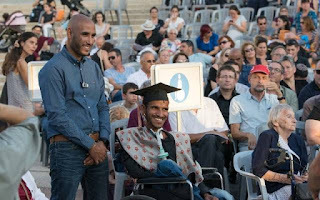 This is the inspiring story of an Israeli Bedouin who overcame social and physical obstacles to achieve his dream. For full article read here. Among the graduates receiving their doctoral degrees at Ben Gurion University of the Negev on Wednesday, one stood out above the rest. Ramadan Abu-Ragila, 34, has muscular dystrophy, a degenerative disease that results in increasing weakening and breakdown of skeletal muscles. He is wheelchair bound and relies on an oxygen machine to breathe. 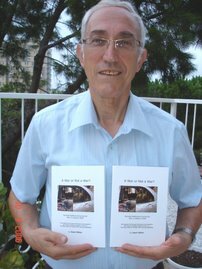 A Bedouin, from the town of Segev Shalom, southeast of Beersheba, Abu-Ragila has just completed his doctorate in physics, specializing in the diffusion of water particles. “I felt enormous satisfaction at achieving a goal and reaching a far off point that I had set for myself,” Abu-Ragila told Tazpit Press Service (TPS). Abu-Ragila didn’t face those challenges alone. His brother Jihad, who is two years younger, took it upon himself to help his elder sibling achieve his goals. “One day I saw Ramadan sitting at home. He told me he had enrolled to study nuclear engineering at university, but didn’t have a way to get to Beer Sheva. I decided I would help him, and from the first day of his first degree, right through to his doctorate I accompanied him. He was the brains and I supplied the legs,” said Jihad. Ramadan says the switch from the sheltered life of a small Bedouin village to the world of academia was not an easy transition. “At the beginning it was very difficult, the first month, the first year. They were really hard,” Abu-Ragila recounted. “I understood that the transition from high school to academia was not at all simple. But thankfully I had a very supportive environment. My brother Jihad, my family and friends. Slowly I got used to it. My success is their success,” he says. The first trip to Israel by an Indian prime minister reflects the significant expansion in relations between the two countries that has taken place since the establishment of full diplomatic relations in 1992. The burgeoning relationship is based on similar strategic agendas and buttressed by extensive defense ties. Modi’s government has shed its predecessors’ reservations about regular public discussions regarding India’s ties with Israel and has even modified voting patterns at multilateral fora. For Israel, Islamic radicals in the Arab world and in the Islamic Republic of Iran constitute a constant security challenge. This challenge has become more acute as Iran’s nuclear potential has grown. The more recent ISIS phenomenon has ramifications beyond the battlefields of Iraq and Syria, as its offshoots threaten the stability of Egypt and Jordan — Israel’s neighbors — and are increasingly sources of concern in south and southeast Asia. India has gradually overcome its inhibitions and engaged in security cooperation with Israel. 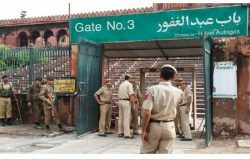 The November 2008 Mumbai terrorist attacks underscored the need for better counterterrorism preparations in India and elicited greater cooperation with Israeli agencies. New Delhi purchased advanced radar and communications equipment from Israel, as well as portable battlefield radars, hand‐held thermals, night warfare vision equipment, and electronic fences to improve border monitoring. A long list of Israeli military items, such as ammunition, UAV parts, and even missiles (Spike anti‐armor, the Python‐4 air‐to‐air, naval Barak‐8 surface‐to‐air) are being produced in India. Israel was the third‐largest arms supplier to India in the three years ending March 2016. In April 2017, India signed a contract worth about $2 billion to procure anti‐tank missiles and air defense systems from the Israel Aerospace Industry (IAI). This was the largest order in Israel’s history. One month later, the IAI secured another contract for $630 million to supply Barak‐8 missiles for the Indian Navy. Both deals involve technology transfer and production in India. These deals are part of PM Modi’s $250 billion plan to modernize the armed forces by 2025 amid tensions with neighbors China and Pakistan. The Indian‐Israeli nexus has various Indian Ocean implications, particularly in response to China’s growing presence. The Indian Ocean, where India is an important actor, has become an area of growing interest for Israel because of its apprehensions about Iran and Pakistan. For Israel, good relations with India reflect awareness of structural changes in the international system as the center of gravity moves to Asia and the Pacific Rim. India is an extremely important protagonist that requires Israel’s utmost attention. This article originally appeared in Asia Pacific Bulletin on June 7, 2017.